We call it a slackline, but as recently as 2 or 3 years ago the future seemed to be in making lines tighter and tighter. Slackline discussion groups were saturated with talk on how to combine pulleys and brakes and multipliers to tension a slackline with as much mechanical advantage as possible. In all the talk of 9:1 this, and 15kn that, there was an implicit assumption that as lines got longer they would need to get tighter. Today, that assumption has been refuted, and possibly inverted. Online conversation is dominated by phrases like “hand tension” and “sag is swag”. A few years ago, it was commonly believed that a tighter line is an easier line. Now, it is an open secret that boundary-pushing lines are considered much harder to tame when they are tight. Low tension is seen as both cool and expedient. How did a sport with “slack” in the name become obsessed with high tension lines, and then why did high tension suddenly fall out of style? Is it simply a matter of one fad being replaced by another? Is it possible that in a few years the trend will again reverse and everybody will be scrambling to put together a 9:1 pulley system again? 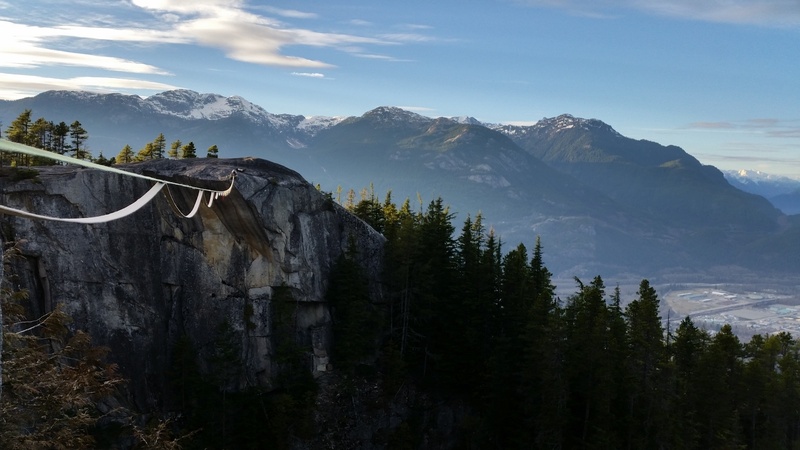 While there is undoubtedly an element of trend-following, there are also some underlying facts that drive these changes, and that tell us something about the true nature of slacklining. In a world where tightrope artists have performed for hundreds of years, is there any justification in swapping “slack” for “tight” and “line” for “rope” and calling it a new sport? It sometimes seems to me that there is not, but I’ll argue that if slacklining is to have an independent identity, then the recent move towards loose lines is the way forward, while the previous era of high tension lines was an unfortunate, if predictable, detour away from the core of the sport. In essence, I want to say that the word “slack” was not arbitrary, it was destiny. The classic Lost Arrow Spire highline. Photo by Max Silver. Slacklining was invented in the 1970s, and refined in and around camp 4 in Yosemite valley. Of course, the history of people balancing on narrow objects goes back much further than the ‘70s, so what exactly was invented by this band of rock climbers? Slacklining is distinguished from earlier balance traditions in two significant ways. First, the motivation for slacklining is usually personal challenge and development, rather than public performance and showmanship. Slacklining is driven by the same kind of “because it is there” mentality that is found in climbing, whereas older balance traditions like tightwire and slackrope are more associated with circus artists. Second, slacklines are usually made of flat webbing woven from relatively modern synthetic materials like nylon and polyester, while the tightwires and slackropes seen in the circus are made from, well, wires and ropes, using much older technology. Slacklining wouldn’t be what it is today without the dual influences of rock climbing culture combined with the new availability of webbing that is strong, light, flat, and affordable. Without this new material, it seems unlikely that the climbers’ rest-day activity of balancing on chains between posts in the parking lot would lead to a new movement. But nylon webbing is a staple in rock climbing gear, and once it was discovered that webbing feels nice to walk on, a new kind of funambulism was born. The full significance of the change was probably not obvious at the time, since walking on a short rope or chain is not that different from walking on a short piece of webbing. In those early days, webbing was adopted because it is cheap, easy to carry around, and is flat so it doesn’t roll under your foot like a rope. It took another 30 years for the new possibilities that webbing opened up to begin to be realized. To see why strong and light synthetic webbing is so important, we’ll need to consider the materials that were previously available, and in particular how those materials affected the balance traditions of the time. Before the invention of synthetic materials, the best available technologies for those select few weirdos who wanted to connect two points with a line and walk on it were natural fiber ropes and steel cables. To see what kind of balance activities these materials lend themselves to, we need to develop a little vocabulary for different types of balance. When it comes to balancing on a skinny surface, it makes a big difference whether the surface itself can move from side to side. Consider two simple cases: balancing on a railing, and balancing on a short and loose rope. On the railing, your feet stay still, and your body must move to keep itself over the railing. I’ll call this type of balancing “railing mode”. On the short and loose rope, your feet can move from side to side with the rope, so rather than the body being kept over the feet, the feet can be kept under the body. I’ll call this type of balance “slack mode”. Since people spend most of their lives walking around on ground that does not move, railing mode balance is more intuitive than slack mode for absolute beginners. But given a few weeks or months of practice, slack mode balance becomes easier than railing mode because of the extra freedom to move your feet back under you in the event that your body leans too far to one side. So railing mode is a little trickier than slack mode, but the advantage of railing mode is that the difficulty is independent of how long the railing is, as long as the assumption that the railing doesn’t move holds true. If you can walk a railing for fifty feet, you can walk it for a mile if you stay focused. Slack mode, on the other hand, gets more complicated when the line gets longer. Slack mode is only easy when the line is both short enough that the whole line moves together, and light enough that the weight of the line is small compared to the weight of the person walking on it. You could keep it loose which works fine with a heavy rope or cable as long as it is not too long, but anyone who has had the chance to try it will tell you that a heavy and loose line gets extremely difficult to walk as it gets longer. For a performer who wants to look poised and in control, a long, heavy, and loose line is impractical, but a short and loose line holds many possibilities. This is the logic that leads to the circus tradition of slackrope walking. The other possibility is to use a strong steel cable, and get it tight enough that it approximates a railing. This strategy of course leads to the practice of tightwire walking. The cables used to make a line like this need to be quite heavy, which means that if the line did move it would be extremely difficult for a walker to control it. In constructing a tightwire, it is considered a legitimate strategy to stabilize the cable by anchoring it at several places along its span to prevent the whole length of the cable from oscillating together. This kind of intermediate anchoring makes sense if the goal is to walk something like a long railing. The challenge for the walker is to maintain railing mode balance over a long distance, rather than to maintain slack mode balance in the difficult conditions of a long, heavy, and movable line. In summary, the balance traditions that emerged and persisted in the era of steel cables and natural fiber ropes include short and loose lines, long and tight lines, but not long and loose lines. We can only speculate about the logic behind the choice of the name slackline. I’ve always thought it must have been chosen to be in opposition to the established concept of a “tightrope”. That initial impulse towards difference is then immediately contradicted by the practice of making the line as tight as possible, which makes it easier to walk, at least in the short term. The inversion of “tight” to “slack” was woven into the sport at the very beginning, even if it was initially more wordplay than action. In addition to this practical reason for high tension was the belief that the walk would be easier that way. This was probably true at the time, but it lead the sport into a kind of cul-de-sac. To see what I mean by that, we need to return to the discussion of slack mode and railing mode balance. My concept of slack mode balance is defined for an idealized situation where the line is short, so that the line moves together as a unit, and light, so that the weight of the line is small compared to the walker. As lines get longer, both of these assumptions break down: the line gets wiggly, and heavy. Wiggly, because longer lines can have standing oscillations with nodes (like a vibrating guitar string), as well as pulses that visibly travel along the line, reflect at the anchors, and come back at the walker. Heavy, because the total weight of the longer line can mean that these oscillations can have a “back action” on the slackliner, i.e. they can knock you off the line. Now I can say the basic idea of the high tension cul-de-sac: the challenges of a wiggly line can be mitigated by adding tension as long as the total line weight isn’t too high. Lines start to get wiggly above around 100ft, which is still too short for the weight to be a big issue. The cutoff is fuzzy and subject to personal preference, but I would say that up to around 200-300ft, with a single layer of light webbing, higher tension does keep the wiggliness of a line more under control. However, at some point the line will get long enough that even with the max amount of tension that can safely be applied to the webbing, the line will wiggle significantly. At this point, the difficulty of the line can start to increase quickly, because the wiggles that do appear will be heavy. The reason that high tension wiggles are heavier is the same reason that adding tension helped reduce the wiggles at shorter lengths: higher tension makes the line “move together”. When the line is short enough, that can be an advantage because when the whole line moves together that is closer to the ideal of slack mode. But when a line gets long enough to move almost-but-not-quite all together, then the wiggles that do form tend to be very long. The longer the wiggle, the more webbing involved, which means more weight when the wiggle comes back at you and tries to knock you off the line. So this is the high tension cul-de-sac: adding tension helps keep the wiggles under control as long as the line weight is not a big factor, but once the line gets long enough that it wiggles no matter what, high tension makes the them heavier and more potent. The solution isn’t just a little more or less tension, but a total change in walking style. But if your training progression has been to tighter and tighter lines, the big jump sideways to very loose and long lines may not be possible. You may have to backtrack, and start again along a different path. Pablo Signoret on 170m of loose polyester. Photo by Pierre Chauffour. In the background of the progression to longer and tighter lines there were some who preferred to walk looser lines. There were a certain amount of bragging rights associated with walking a looser version of a line, and while some claimed to prefer loose lines, a lot of people assumed they just liked making things more difficult for themselves. “Once I started to get into lines that were longer than 400 feet, I started to realize that the difficulty changes with how much tension there is on the line. I played around a lot with different tensions on different lengths and found a happy medium between keeping the anchor height reasonable and keeping the walkability high. When I met Chris Rigby, my eyes opened further to the idea that looser is easier/better. He was rigging lines even looser than I was and doing crazy dynamic tricks on the lines as well. The idea of loose lines changed for me after that. Chris and I would rig these monster highlines and try and find the absolute perfect amount of sag to have. We found our number right at 800 lbs (3.56 kN) for a Type 18 line. Then there was one day where we were derigging the line and we needed someone to go to the other side to derig the anchor. We had already detensioned but hadn't removed any gear from the system and I thought it would be much more efficient to walk to the other side rather than hike around. So, I got on the 80m long highline that was hanging loosely between the anchor points and walked across. It was so amazingly easy compared to before! From that point I knew that tension did not make the line easier. In fact, it was the opposite! So what is going on here? To complete this story using the concepts we’ve developed, the discovery here is that while loose means more wiggles, the wiggles have less mass to them. If the line hangs like a noodle, giving it a shimmy while trying to maintain balance doesn’t set big sections of the line swinging together the way it can with a tighter line. In the context of highlines, another contribution to this effect is a loose backup that hangs in loops below the main line, but that is a topic for another day. Learning this loose line style is more difficult and intimidating to begin with, but the road of progression it offers is longer than the tight line alternative. 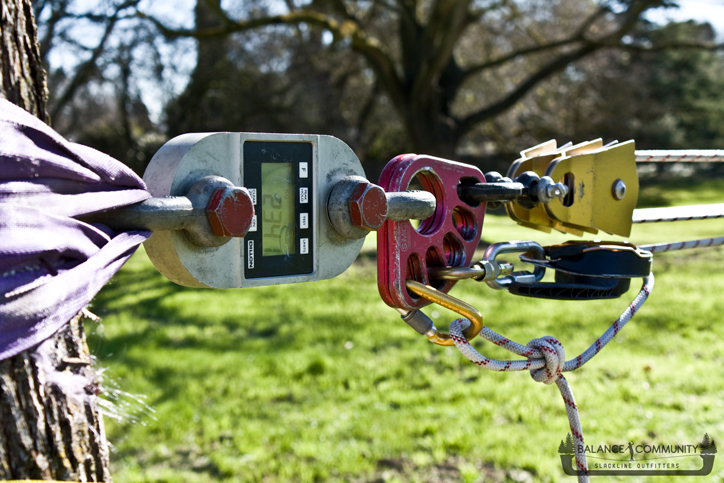 This has been definitively shown by the recent explosion of new slackline records, all at relatively low tensions. I think that this progression towards big, loose lines is really the story of slacklining finding its true identity. Until recently, it had been kind of a dirtbag’s version of tightrope walking. 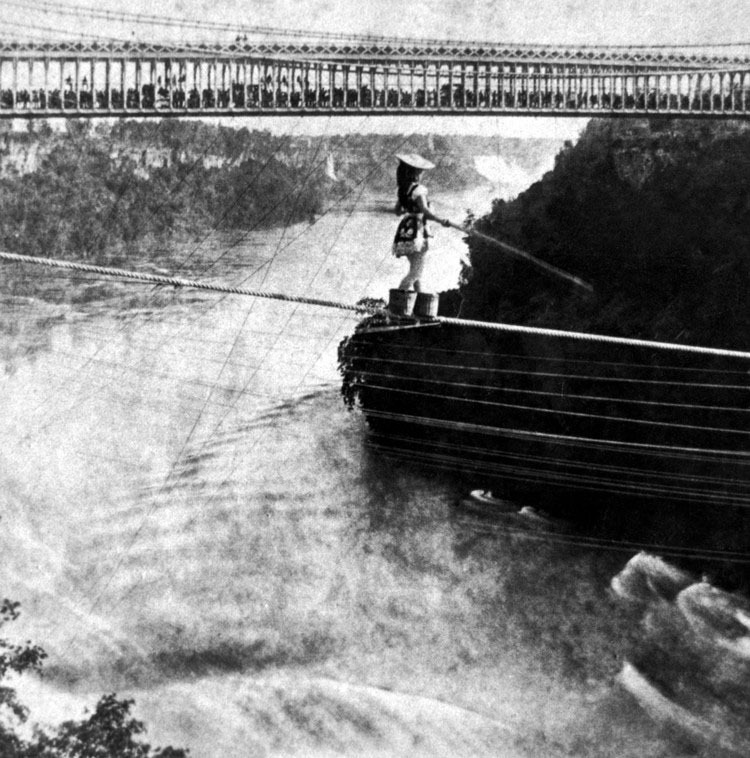 Slackliners kept track of their own "world records", but they weren't truly significant because tightrope artists had previously done many bigger and more impressive things. And as slacklining progressed in the tighter lines direction, the amount of gear and infrastructure needed for a line was also starting to head in the direction of the tightrope: heavy and impractical. In the new era of loose lines, slackliners are crossing gaps in a style that has never been pursued before. The records for longest gaps crossed are still held by tightrope walkers, but the slackline community is catching up ridiculously quickly. 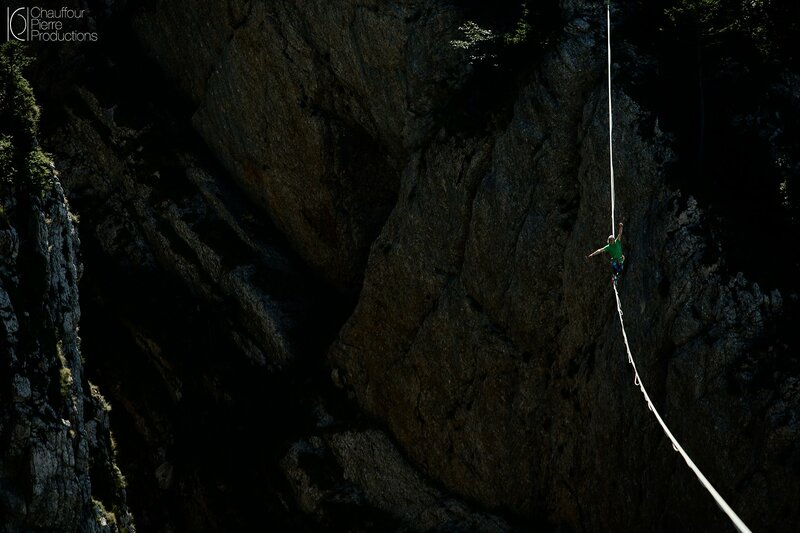 And unlike a tightrope, a loose slackline can be rigged fast and light. Even the biggest lines can go up and down in a matter of a few days, and they can be put up in natural areas in a "leave no trace" style. The kind of minimalism that loose lines allow is also what is propelling new explorations into alpine highlining. Just a few years ago doing a highline in the mountains meant hauling a heavy pulley system to tension the line. We're now able to leave that behind, which is allowing us to consider more ambitious and remote projects. This loose line revolution has changed slacklining from a rough copy of tightrope walking into a legitimately new human activity, and the frontiers it has opened up are being explored right now.